Jason: It's been almost a year since the album came out. How have things been going both with the album and on the road? Amy: Awesome. We've been all over the world. We've been to all six inhabited continents since then. We went to Europe, South Africa, South America, Scandinavia, Middle East, all over the place. It's been really great everywhere. It's been cool to tour so many places again and some new places too. The shows have been well received and big and it's been great. Almost like we never left. Jason: In the US you have done a couple of headline tours in support of The Open Door. Do you plan to do a bigger arena tour after the Family Values tour ends? Amy: Uh huh. Yeah. This would have been the time for us to do the bigger tour I've been talking about, but then the Family Values thing came up and we thought that it would be cool to do something with a lot of other bands during the summer time. It's festival season. I don't know. More bang for your buck. Besides Korn's amazing and there's a lot of other great bands on the bill. It's better this way because instead of doing two of our own tours right in a row. We can just do this and then have something different at the end of the year. Jason: Speaking of Korn, you did the duet of Freak On A Leash with them recently. You also play a lot of cover songs in concert as well. Would you think about a cover album or putting a cover onto the next album? Amy: I don't think we've done that many covers. We actually hadn't been playing a cover the whole time we've been touring The Open Door until like two weeks ago. We started playing People Are Strange just for fun to change it up on the Family Values tour. No, I don't think I would do a covers album at all. I think it would be cool one day to maybe put out a b-sides and rarities, because I think there's a lot of songs that we've made that either didn't quite make the cut or didn't fit on the album for whatever reason. I don't know. Some day that could be really interesting. I always love when bands put out b-sides and rarities. Sometimes it's my favorite CD. Jason: And you get all the live and other songs that you can't put on a regular album. Jason: How has it been going with the new band members? Amy: Incredible. It's been really great. Troy and Will are very, very talented musicians. I want to only say the positive things about them. I want to be nice. (laughs) They're really, really great and it's given us a lot of ability. I've felt like we were kind of trapped before, because things kind of got to a stagnant point. Like when nothing was moving forward it was kind of like just barely getting through every show. There was some misery in the band and John and Rocky just didn't want to be doing it anymore. So it was really frustrating for the rest of us, because we love the band and love the new songs and want to be here rocking out in front of thousands of people. I mean, how can you not? So it's really cool to have not only two very talented guys in band, but also two people that really appreciate and love this music and this band. So we're having a lot of fun. We get along and we play scrabble together. We're going camping tonight. So it's been a really good time. It feels like a breath of fresh air. Jason: You have a good collaboration with Terry already. Do you plan to collaborate more with everyone in the band now? Amy: I don't know. I don't want to jinx myself and say that again, because I said that before The Open Door and that didn't work. So you never know how it's going to be writing with people. We've successfully been able to make up little pieces here and there. Segways into other songs. I mean it just comes naturally for us. We're all pretty open minded and creative and we sort of think on the same page and like the same bands. So I can easily see us all writing together, yes. But there's no plan, just because by the time we finish not this tour but the one after that we were talking about. We're just gonna take some good time off for I don't know. Indefinitely. Until we figure out the next thing to do. So we'll see. Jason: With The Open Door you had a lot of issues you brought out during it about your relationship with Shaun. Now that you're married and happier, can we expect a different style or different lyrics in your newer writing? Amy: You can always expect a different style. I never want to put out the same record twice. I always want to be reinventing myself and pushing myself to the new limit. But as far as writing happy songs and putting out a Sarah McLachlan record. It's just not really me. I want to be doing something different, but I also still want it to be interesting and unique and challenging. I don't know. I like giving people the exact opposite of what they think they expect. (laughs) So we'll see. Maybe I'll just put out a clarinet record or something. (laughs) A whistling choir. Jason: I understand there are talks of going solo down the road? Jason: Have you thought about working with Wind-Up on something solo in addition to the Evanescence work, following such other frontwomen as Gwen Stefani and Fergie by releasing a solo album? Amy: That's not me. I definitely think I could work by myself on something, but it wouldn't be in this music world. It wouldn't be in this sense of touring. I don't know. It would be completely different. Everything that I want to do as a rock musician I get to do with Evanescence. If I was ever to do something on my own or with different people, it would be because it was completely different. Such as I really have always wanted to get into scoring. I would love to score a film and I'm gonna try to do something completely different than Evanescence along those lines at some point. So there's that, but I don't know if that counts as being a solo artist. Definitely not in the sense that Fergie or Gwen Stefani are solo artists. I'm not really interested in that. Jason: So more of using your piano skills to work on something? Amy: Hopefully that and lot more. Hopefully a whole symphony. So we'll see. Jason: That would be kind of cool. Jason: We've been seeing a lot more female fronted bands come over to America this year. Your band has paved the way so all of these bands can come over from Europe. Revolver just put on a female metal tour. Where do you see yourself in the female scene and how you fit in? Amy: I don't know really how to answer that. I don't really look at it like it's a whole different genre because I'm a girl. I think that is something that I've always felt was an advantage for us because we had something different than most of the bands out there. It's cool to be on this bill and be one of two females total, because it changes it up and there's something that we have that they don't which is just this sort of passionate femininity. So it's cool to have that. I've always looked at it as a positive thing. But I don't know where I stand and all that stuff. Jason: Would you tour with other female bands? Amy: Absolutely. I would love to. How cool would that be. I definitely have always had a lot of female artists that I love and admire. A lot of them are older now or are in a completely different style of music so I don't know how the tour would work. (laughs) I think we'd be the heaviest band on the bill for sure. Jason: Sort of like a Lillith Fair but for heavier bands? Amy: That would be really fun. Yes. Jason: So with your influence in the industry you can get something like that put together. Amy: You gotta help me put that together. I don't know if it's possible. I don't even know who I would grab. But yeah, I would love to have a chick tour. But then how would the guys in the band feel? They'd be like "OK, but I'm a dude. Don't forget me". I don't know. There's more to it than that. Jason: When you're done with this touring cycle are you planning to go right back into the studio? Amy: No. I really don't want to do that. Even less than last time. Last time I was exhausted after touring. A lot more than we will be this time, because we were just being driven into the ground. But even still after just like one month I was so motivated. So many things had happened that affected me personally and I finally had the freedom to really write whatever I wanted, that I was just dying to write the new record. We just spent a long time on it. This time I'm definitely musically inspired and want to work, but I don't want to go right back into doing the exact same thing. I think I'm just going to take it easy. I just got married three months ago. Take a break. Be normal. Buy groceries. Go to the movies. You know. Jason: Has your marriage changed your attitude or views on life? Jason: And how has the change been in terms of moving to New York. Do you plan to stay there? Amy: Yeah, I love it there. I don't know what to say. I absolutely love it there. I haven't gotten to spend a ton of time there, because we've been just touring pretty much almost the whole time I've lived there. But it's a lot more me than Los Angeles. I lived in California for five years. Again I'm not there very much. And yeah, it was alright, but definitely not my personality. I'm laid back and everything, but it's a lot about who you know and the whole Hollywood thing. And I just. I don't fit into that at all. I'm just the girl in the corner wishing I could go home. (laughs) So it's a lot cooler to be in New York where there are so many different cultures and music and art and just people from all over the world. It's actually really cool and everybody has something that they think is a lot more important going on than looking at you. So I can completely blend in. Just walk down the street and be normal. Jason: You said you wanted to do different things for the new album. What kind of direction do you see taking the band? Amy: It's hard to say right now. I don't know. We'll just have to wait to be inspired to know what's really going on. It's going to be hard to say, because we don't write on tour. We actually. It's so much of this stuff that I have to wait until I'm done to zone out and be a writer. We'll see. Jason: You've been doing a lot of meet and greets and other fan activities. How do you react to your fans and how do you feel about them? Amy: I love the fans. How can you not love them. They are nothing but cool to us and they've supported us. Everytime I ask them for anything they do it. The first couple of Korn shows were OK and the fan response kind of sucked. Not that they were negative to us. They just weren't doing anything. I know our fans are out there, but I almost feel like they were intimidated by the Korn fans and didn't want to get too excited. So I talked to a couple of the fan club members when they came to the show. I was like "Hey. By the way. 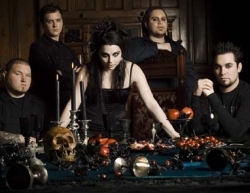 Go on the message board and tell everybody if you're an Evanescence fan then represent, because we need you out there and make some noise" and they were like "OK". Next show was like a completely different world and it's been cool ever since. So we definitely have a rad following and I have nothing but love for our fans. Jason: A lot of those fans consider you an idol. How does it feel to know all of those girls look up to you and what you have done to show that women can succeed in an industry dominated by men? Amy: Um. That's a lot of pressure. (laughs) I am a big sister and I just feel like I look at our fans and I see my younger siblings. I love em. I'm not perfect, you know. But I will do my best to try to be a good example for them and hopefully leave them to think for themselves. I think that's the most important thing. I don't know. I guess that's the end of my answer. Jason: If you had one message to get out for people who didn't know Amy Lee, what would the message be? Jason: How is the interaction while playing to your fans at the shows? Amy: It's great. Honestly we've played our songs a million times and if I was at home doing nothing, bored on a Saturday, I don't think I would blast my own CD. I've heard it. (laughs) But to get up there in front of the fans and actually have their energy and their excitement about Evanescence music makes playing the songs incredible. I love playing our music for them. It's like it is the first time. You get lost in it to the point where you almost forget what's coming. So it's a completely different experience and I love it. There's always, especially at these shows, there are always fans in the front. But there are sections. Either the left or the right or somewhere in the middle. Every night there is this one group of kids that are just freaking out. So that can be my comfort zone that every time I start to feel a little insecure I just keep going back to that spot. Drawing from them. Jason: Are there any songs you are sick of playing or songs you really enjoy playing every night? Amy: I love our whole set right now. We honestly have been changing it a little bit here and there for the past few months. Doing some new things. Doing some things we haven't done in a long time. It's cool. No. There's nothing that we play every night that I don't like. Jason: What does the future hold for you? Amy: You never know. There's always going to be music in it. For sure. It's my passion. But I plan on being happily married. Trying to do something new musically. I don't want to just go back into doing the same old thing like I said. I guess these are all answers I have already given. But I don't know. Maybe start taking lessons on a new instrument and just kind of educate myself a little bit in the time off. Then come up with something totally weird. Change everybody's mind again. Our sincerest thanks to Amy for taking the time to perform this interview with Sonic Cathedral! For more information visit www.evanescence.com or www.winduprecords.com.